Auburn City Hall is located at 1225 Lincoln Way, Auburn, CA 95603; phone: 530-823-4211. Photo: Irene Burns House, ca. 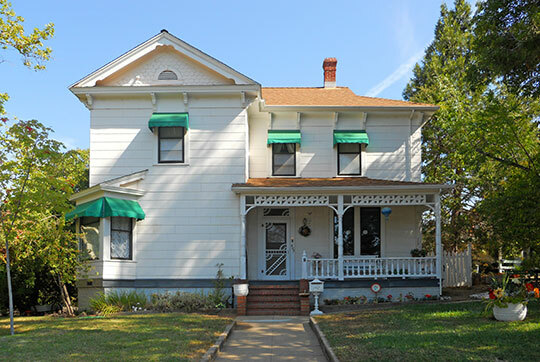 1895, 405 Linden Avenue, Auburn, CA. Listed on the National Register of Historic Places in 1977. Photographed by user:YankeeSpirit (own work), 2014, [cc-by-3.0 (creativecommons.org/licenses/by/3.0)], via Wikimedia Commons, accessed December, 2014. Auburn was established as the Placer County Seat in 1851, 3 years after Claude Chana discovered gold in the Auburn Ravine. The discovery of gold at Auburn led immediately to exploration and intensive Placer mining and became one of the earliest mining camps in California. Mining dominated the economy and kept the town prosperous. The period immediately following the Gold Rush between the 1860s and 1870s, Auburn had a reputation as a health resort with social and cultural centers including a private normal school and a college. Auburn was considered a major transportation center, providing access to gold mines in the earlier days, toll roads for stagecoaches and freight wagons, and railway transportation on the Central Pacific. The city was a major transportation and supply center for mining areas and was later replaced by orchard crops and animal husbandry. After the depression, mining activities ceased and did not reopen after the war. However, agriculture grew after the introduction of artificial water supplies was developed. F. Birdsall built a plank reservoir that held over one million gallons of water in the mid-1880s and installed a thirteen inch pipe from the dam in Auburn to Pino in 1888 and was later sold to the South Yuba Water Company in 1889. This system was later taken over by PG&E with later additions of the Wise Canal, Rock Creek Dam, and associated canals. In addition to the Auburn Bohemia Property, the Cal-Ida Lumber Company was built during the World War II producing crates for fruits and vegetables shipped through the Central Valley. Cal-Ida was sold to the DeGeorgio Corporation in 1969 and later sold to the Bohemia Lumber company in 1978. The lumber company operated the mill until their closure in 1985. Bohemia Retail Project, Placer County California, www.placer.ca.gov, accessed August, 2011.